To our Heroes in the field, braving the elements to collect the best possible samples for analysis: We want to make your days a little easier this summer. 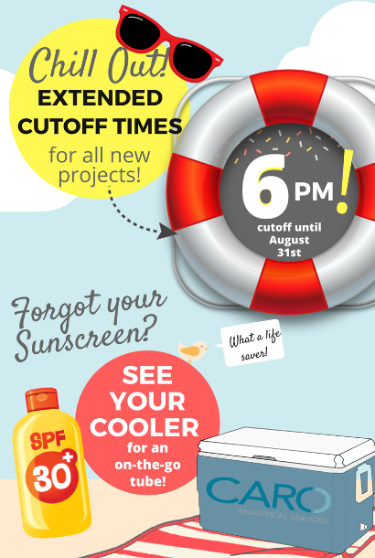 From now until the end of August, we have extended our cutoff time to 6pm for all new projects or samples submitted to CARO with “6pm Promo” noted on the COC! (Now THAT’S something to get excited about!) Take those extra few minutes to focus on collecting the perfect BTEX core or perfecting that filtration technique, and know that your TATs will not be affected by a later submission. We’ve got your back in more ways than one! For a limited time, check out your cooler for a BONUS pack of sunscreen. Sampling technique is important, and so is sun safety – don’t forget to reapply every 2 hours. Give us a call today at 1-877-769-9646.